Born in England in 1642, John Archdale first saw the American colonies in 1664, when he traveled to Maine as his brother-in-law’s agent. Back in England in 1681, Archdale purchased a share in the Carolina proprietorship. In 1683 John Archdale went to North Carolina as collector of quitrents. After the Lords Proprietors commissioned him governor of Carolina in August 1694, Archdale appointed Thomas Harvey to act as deputy governor for North Carolina, and set out for Charles Towne. John Archdale replaced Joseph Blake as governor in August 1695; when he sailed for England in October 1696, he named Blake his deputy governor. Governor Archdale never returned to Carolina. He died in England 1717. John Archdale’s son, Thomas Archdale, was a young boy when Archdale purchased a proprietor’s share in Carolina. The share was held in trust for Thomas, in whose name Lot 107 in Charles Towne was granted in 1683. The block bounded by today’s Meeting, Broad, King, and Queen streets became known as Archdale Square. Towles, Louis P. “Archdale, John.” Walter Edgar, ed. South Carolina Encyclopedia. University of South Carolina Press, 2006. "John Archdale's address soon after becoming governor, Charleston, S.C., August 1695." Engraving published ca. 1876. 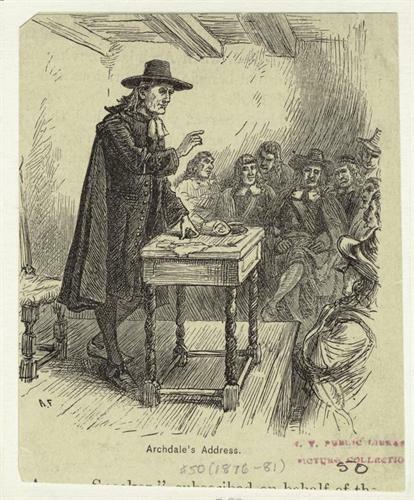 Archdale was South Carolina’s only Quaker governor.